Here I am holding my black belt. Last week, my friend at college asked me how long it takes to get one. Pondering all the torture I had to endure to be viewed as a worthy martial artist by my Sensei. At last I recalled one crucial detail. "Depends on how long Amazon takes to find your address" I responded. Most people take this as a joke and miss the serious argument behind it. See, the point is that the belt does not define the fighter. There are little kids, incapable of throwing basic kicks, who are awarded black belts simply because their parents paid their fees. Of course there are schools that do adhere to the belt system as a strict ladder of progression. The best examples are Judo and Brazilian Jiu-Jitsu. Notice how both of these are grappling arts. Due to their skill reliant nature, an incompetent black belt would quickly be exposed as a fraud after a sparring session. However, the same cannot be said about Karate. Many Karate schools take sparring out of the equation. and the school becomes a business. I believe that belts are meaningless. In my mind, there are only white belts and black belts. And a lot of the black belts are in fact white belts. he did not give himself a black belt. By that logic, someone without even a white belt was handing out black belts to students. The legendary Kenwa Mabuni met Jigoro Kano once. the founder of Judo told him his skill rivalled that of a fourth dan Judoka. holds a tenth degree black belt. But he is in fact an eighth degree black belt. See, this is where it gets confusing. To hold a black belt in a martial art, you need to have received it from a governing body. Kanazawa Sensei received his tenth dan from the IMAF. And he received his eighth dan from the SKIF. He holds two different ranks in the same martial art. This is when I realised that all my hard work meant nothing. I had my belt from a little known organisation called the IASK. 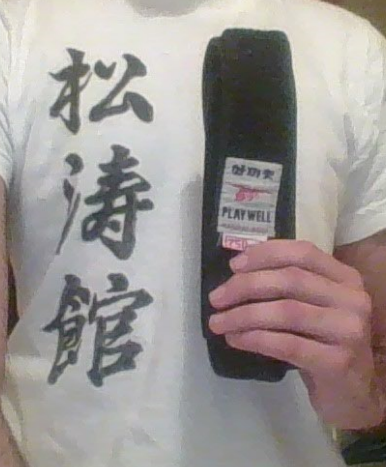 In a JKA dojo I am still a white belt. Regardless of whether I know more than they do. If all goes well, I will soon move out of my home town. I aim to study Karate under the British Combat Association. I also want to study Judo and Jiu-Jitsu as a training ground for my grappling skills. Once I have enough fighting experience I want to refine my style of Karate into an effective combat system. That, however, will take me decades to accomplish.